PAX Prime is this weekend and already 2K is making some news… About their future news! They’ve revealed today that nice new gameplay footage and other “shenanigans” are to be expected this weekend at two separate panels. 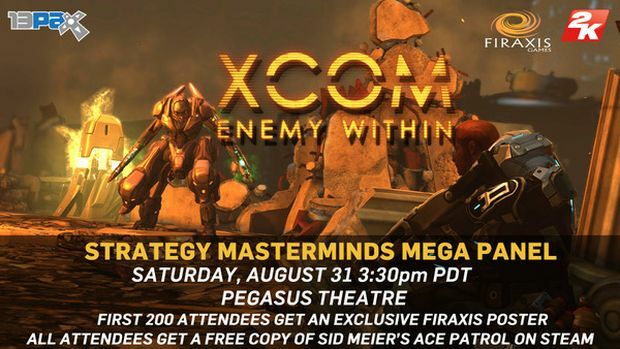 The first panel is the “Strategy Masterminds Mega Panel” which will feature XCOM: Enemy Within and reveal some more information on what the heck that product is. This panel will be Saturday, August 31st 3:30 PM PDT at the Pegasus Theatre. After that is the “Inside Gearbox Software” panel, which will be Monday, September 2nd at 2:30 PM PDT and will be held in the Main Theatre. At the Gearbox panel, expect information regarding their upcoming DLC plans. With the Gearbox folks, shenanigans should be a given at this point. You can watch streams of the panels here. PAX begins this weekend. Get excited!